FastCompany.com: Why redesign the subway map? Is the official one really that terrible? Artemy Lebedev: We’ve decided to redesign the map because the official map didn’t show any symptoms of getting better. I call it “explosion of a bicycle chain factory.” That describes it perfectly. What sort of research did you do? Were you consulting other subway maps? If so, which ones? London is classic, NY is nice, Tokyo is nightmare. We’ve had them all. Moscow is really circle-based, so we have our own identity which we needed to preserve. The map took nearly four years to design! Why so long? Actually, it took us about a month to design it. We spent four years on redesigning. We were coming with some ideas, tried to live with them, then went ahead. 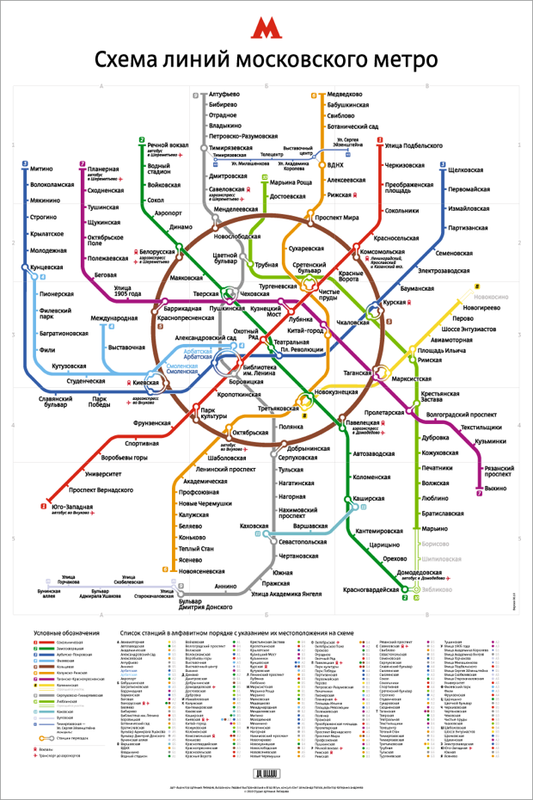 We didn’t want any short-term attention (anyone designing new Moscow subway map would gain short-term attention). We needed something that could be The Map for the next decade. How are you going about getting the map officially adopted? We will make it as widespread as possible first. We have had similar experience with promoting the rouble currency sign, which is used all over the country while not being “official” yet. You’re really open about your design process online. Most designers are too worried that people will steal their ideas. Why divulge your methods? My method is simple: share all the ideas as wide as possible because there are more ideas on the way. I have no shortage of them so I’m not worried that someday there will be have nothing to share. And just in case someone worries: this method works very well. Are there other transit maps, public signs, facilities etc. in Moscow badly in need of a redesign? Any plans to take those on next? Actually, this is the only widely known scheme in Moscow. So now we may concentrate on redesigning Saint Petersburg subway map, which is just as ugly as its Moscow cousin. Russia’s powerhouse design firm Art. Lebedev Studio (of Optimus keyboard fame) recentlyunveiled a striking new map that at long last drags the Moscow Metroout of the Soviet era. The design, though not an official replacement, took nearly four years to complete. It costs 350 rubles (around $14) and comes in various sizes and levels of detail. Studio founder Artemy Lebedev released the map publicly in hopes that it will be adopted as the official map, and told us via email that he thinks that could happen in less than five years. The map owes more to the pop stylings of New York (which just released a simplified version of its subway map) and London, than to the drab official map currently hanging in metro cars, shown here. Sure, stations are still organized within and around a central ring,but the similarities end there. Lines are thinner. Stops are represented by ticks; transfer points by dots; andlarger transit hubs by mini rings. The distance between stations iswider, making the whole thing less reminiscent of a crowdedbreadline. Overall, it feels lighter, cleaner, and more spacious. In other cases, old ideas prevailed. Here, the designers toyed with arranging the map around different shapes. But ultimately ruled in favor of the ring, because it’s recognizable to Muscovites. They also considered adding shading a la the Tube. But ruled against it, because the Moscow Metro doesn’t have ticket zones. Hatsoff to Art. Lebedev Studio for a nice, clean map that brings Moscow’s subway system intothe modern era. Now if only the rest of the government could be so niceand clean.